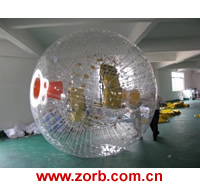 Zorb Limited specializes in manufacturing zorb ball, water ball, body zorbing football, bubble soccer, water pool,water roller, Water inflatables, zorbing ramp, inflatable show ball, inflatable dancer ball, inflatable water sports, inflatable games. With 7 years experience of manufacturing inflatable products, Zorb Limited now has high-tech devices and skilled workers, We provide high quality products with the reasonable price and efficient service. We wholesale & retail zorb ball and bubble football, inflatable water toys, OEM & ODM is Welcome. Zorb Ball is the sport of rolling down a hill inside a giant inflatable ball, AKA: zorb globe, giant inflatable human hamster ball, It's great for using down local hills, parks, play areas, football pitches and zorbing ramp, zorbing orbit. We also can provide you zorb balls for use on water, aqua zorb Ball. Water Ball is for walking on water or inflatable water pool, for floating on water, its a float tank, a dance ball, Inflatable show ball a display ball for placing products inside and for use in show business productions, TV shows and for your own creative ideas. AKA: water walking ball, water walkerz, aqua bubble, More Inflatable water sports. (Price List for zorb ball, water ball, Bubble Football, water pool, water roller, zorbing ramp). Zorb Ball, Water Ball, Inflatable Water Games special manufacturer in China. Factory Address: No.6, Tingshi South Road, Shijing Baiyun, Guangzhou, China. Copyright © 2002-2019 Zorb Limited All rights reserved. * Reproduction in whole or in part without permission is prohibited.